As I’ve mentioned several times (if not more) on my website, there isn’t much that can be done regarding the quality of air outdoors. However, you can have a say within the confines of your own home. Since I suffer from asthma and have mild allergies that tend to “kick off” when I’m exposed to pollen and dust mite debris it’s important for me to have clean, fresh air when I’m indoors. The obvious solution to my predicament was to get an air purifier. The not so obvious part was finding the right one. However, one unit did spark my interest and that’s the Honeywell HHT-011 Compact Air Purifier with Permanent HEPA Filter. I feel the need to address this issue first because I’ve come across a lot of negative reviews on the Honeywell HHT-011 air purifier regarding its HEPA-type filter. What you should know is just because it says permanent filter on the box, it doesn’t mean you should forget about its existence and go about your day. The permanent part means you don’t need to replace the filter every time it collects enough dust and particles. You simply wash it, let it dry and then put it back into the purifier. Even so, you still need to replace it with a new one, but that interval is measured in years rather than days or months. The permanent HEPA filter in the Honeywell HHT-011 is able to filter almost 100% of pet dander, smoke, pollen, mold spores and dust. What’s great about this particular model is it comes with a light indicator that lets you know when it’s time to clean the filter so no more guess work for you! 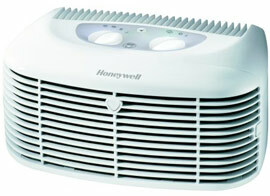 When it comes to noise the Honeywell Compact air purifier fares pretty well. You can choose between three different settings: low, medium and high. The unit is very quiet when set on low which makes it great for use in a bedroom. Even the medium setting is pretty tolerable if you’re not sensitive to a bit of “white noise”, in fact you’ll most likely forget about it being there when using it during the day. It does get a bit loud when set on high, but you only need this setting if there is a large concentration of dust in the room, or a bad smell you need to get rid of quickly. My advice would be to use the first two levels when you’re at home, and set it to high when you’re not around. Although for many people this isn’t an issue. Falling in line with its unobtrusive sound is this purifier’s compact design that makes it suitable for pretty much any room. Compared to some larger units out there this one doesn’t get in the way, and with dimensions of 9.40 by 5.8 by 12.9 inches you won’t have to re-arrange furniture in order to accommodate its size! One great idea is that you can upgrade this air purifier to include an ionizer which adds an additional level of filtration. While this isn’t technically a feature, the price of the Honeywell HHT-011 is so affordable you will be able to purchase several and put one in every room of your home if you want to. The unit also comes with a 3-year warranty. The Honeywell HHT-011 Compact Air Purifier with Permanent HEPA-type filter is one of the most affordable options currently on the market. On top of that, it’s reasonably quiet and takes up very little space. One thing it excels in is its dust collecting capability which I found thoroughly impressive. If this air purifier catches your fancy, have a look on Amazon where you can find great deals and free shipping.